The Fritz X, also known as the Ruhrstahl X-1, was a German precision-guided, armor-piercing bomb used to deadly effect against Allied ships in the Mediterranean in 1943. 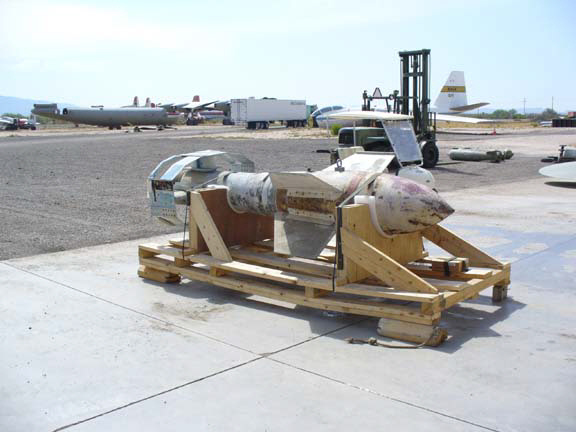 Based on the PC 1400 (1400 kg) bomb, the Fritz X used the same joystick radio-command system employed on the Henschel Hs 293 missile. The control forces were exerted by spoilers on the cruciform tail, a system developed by Dr. Max Kramer at the Luftwaffe experimental establishment in Berlin-Adlershof. The Fritz X had its first and most spectacular success on 9 September 1943 when Do 217 aircraft used it to sink the Italian battleship Roma and damage the battleship Italia as they were sailing to surrender to the Allies. But Allied air defenses soon made further use very difficult. 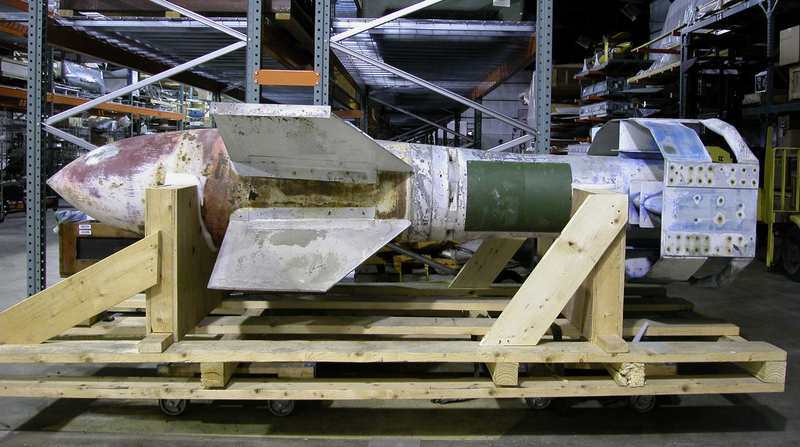 This artifact may have been given to the Smithsonian by the Navy Explosive Ordnance and Disposal School at Indian Head, Maryland. The Fritz X, also known as the Ruhrstahl X-1, SD 1400, PC 1400 X-1 and the FX-1400, was a German precision-guided, armor-piercing bomb used to deadly effect against Allied ships in the Mediterranean in 1943. Based on the PC 1400 (1400 kg) bomb, the Fritz X used the same Strassburg/Kehl joystick radio-command system employed on the Henschel Hs 293 missile. The control forces were exerted by spoilers on the cruciform tail, a system developed by Dr. Max Kramer at the Luftwaffe experimental establishment DVL in Berlin-Adlershof. The Fritz X had its first and most spectacular success on 9 September 1943 when Do 217 aircraft used it to sink the Italian battleship Roma and damage the battleship Italia as they were sailing to surrender to the Allies. But Allied air defenses against the Do 217s, which had to fly slow and level while controlling the bomb, soon made further use impossible. The Fritz X or X-1 proved, however, to be the starting point for further spoiler-controlled missile development at Ruhrstahl, notably of the air-to-air missile X-4. This artifact may have been given to the Smithsonian by the Navy explosive ordnance and disposal school at Indian Head, Maryland. 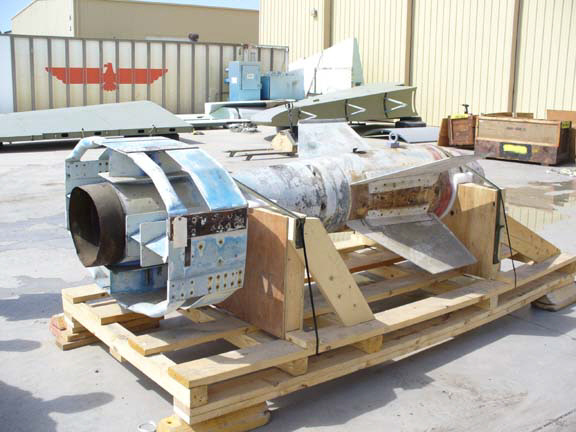 A PC 1400 (1400 kg) armor-piercing bomb was modified with the addition of an enlarged tail: a 12-sided framework around four streamlined fins and a pair of wings mounted in the front of the bomb in an asymmetrical cruciform shape. Two of the longer tail fins had two spoilers, or control surface plates. The spoilers were radio-controlled and solenoid activated and steered the missiles in four directions (up/down and left/right). 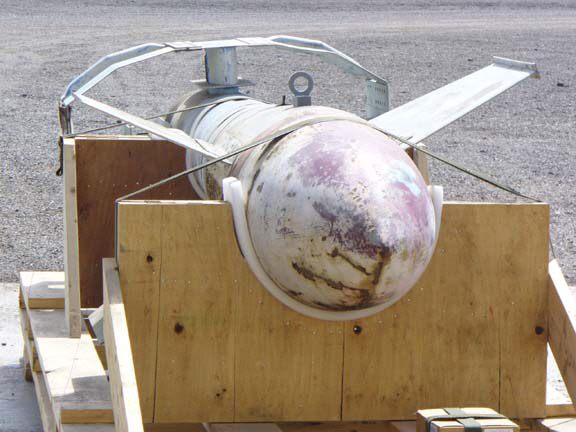 Two gyros stabilized the bomb; together with the Strassburg receiver and associated guidance equipment they were mounted within the tail. The bomb casing was of thick-walled steel with a chromium-vanadium or manganese-silicon steel nose cap, while the body was largely of magnesium alloy with fins of aluminum alloy. The bomb's high explosive charge was amatol and the fuse was an impact delay type. It could be deployed from bomb racks on the Do 217 and He 177. In a typical attack, the bombardier of the carrier plane dropped the missile from an altitude of about 20,000 ft and aimed it by a normal bomb sight. He then sent guidance radio signals to the Fritz-X to keep it in line before reaching the target. He directed the missile by a joy stick attached to the Kehl transmitter in his plane and followed flare candles on the bomb as it descended. For night operations, the carrier airplane dropped flares to illuminate the target while the missile itself was fitted with an electric lamp to aid the bombardier in tracking it. The Fritz X was accurate but subject to radio-jamming. If a flare was shot up by a defending ship target, the bombardier could also momentarily be blinded which could interfere with the missile's aiming. The Fritz X originated in the work of Dr. Max Kramer at the Deutsche Versuchanstalt für Luftfahrt (DVL) in Berlin-Adlershof on controllable bombs, beginning in 1938. In 1940 the Air Ministry became interested in Kramer's work and designated the PC 1400 armor-piercing bomb for development as a guided weapon. The earlier prototypes carried several designations, such as the X-2, X-3, X-5, X-5 and Peter X in the FX 1400 X-1 series. The X designation stemmed from the cross-wing profile of the bomb. The X-2 model had a higher speed (700-mph) and was intended to be fit with an infrared homing device, but this system was not completed and only one X-2 was built. The X-3 was supersonic (900-mph) as well as heavier, larger, and had a greater range (7 miles), but the basic X-1 was simpler to operate and development therefore went forward on this model. Later, when the bomb was already operational, wire-guidance systems such as used on other German missile were successfully tried to prevent jamming, but never operationally deployed. The X-1 was constructed by the Ruhrstahl company and was first tested by the DVL.. Telefunken was one the companies developing the high-frequency radio equipment. Tests were conducted in 1941 at the Luftwaffe test station at Peenemünde, as well as near Foggia, Italy, during March-April 1942. By 1943, the X-1 system reached the manufacturing stage. Ruhrstahl did not get production contracts, and one war-time manufacturer was Rheinmetall-Borsig. Deployed with the Dornier Do 217 group III./KG 100 at the same time as II/KG 100 went operational with Henschel Hs 293 missiles in July 1943, the most notable success came when two of the bombs launched from Do 217s sunk the 46,200-ton Italian battleship Roma by direct hits on 9 September, when the Italian fleet embarked from La Spezia to surrender to the Allied fleet. In September 1943, Fritz Xs dropped by III./KG 100 sank the British cruiser Spartan and British destroyer Janus and many merchant ships, severely damaged the British battleship Warspite, taking her out of action, and damaged the American cruisers Savannah and Philadelphia and the British cruiser Uganda. However, as noted, the vulnerability of the attacking aircraft to Allied fighter ended the use of the Fritz X in the Mediterranean theater shortly thereafter. The Fritz X also saw combat over land in the attempted destruction of bridges over the Oder River in April 1945. As such, the Fritz X was among the few missiles during the war that notable achieved success. By the time the program ended in December 1944 some 1,386 had been produced, falling well short of the planned production of 750 per month. Bill Gunston, The Illustrated Encyclopedia of the World's Rockets & Missiles (New York: Crescent Books, 1979), 106-107. Fritz Hahn, Deutsche Geheimwaffen 1939-1945: Flugzeugbewaffnungen (Heidenheim: Erich Hofmann, 1963), 294-300. Max Kramer, Remote Controlled Dive Bomb (AAF Translation, No. F-TS-SS1-RE) (Dayton, Ohio: Headquarters Air Materiel Command, Wright Field:, 1946). Frederick I. Ordway, III and Ronald C. Wakeford, International Missile and Spacecraft Guide (New York: McGraw-Hill, 1960), 112-113. J.R. Smith and Anthony L. Kay, German Aircraft of the Second World War (London, 1972), 696-99. Originally written by Frank Winter; extensively revised by Michael Neufeld, September 2000.